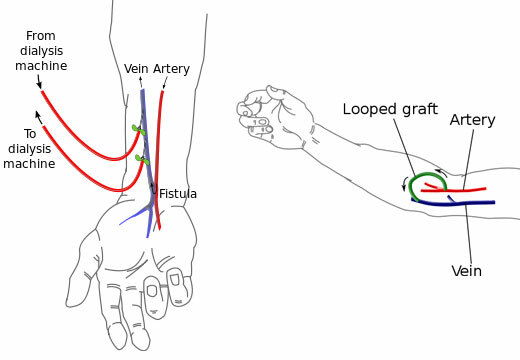 Fistulas are usually created in the nondominant arm and may be situated on the hand (the 'snuffbox' fistula'), the forearm (usually a radiocephalic fistula, or so-called Brescia-Cimino fistula, in which the radial artery is anastomosed to the cephalic vein), or the elbow (usually a brachiocephalic fistula, where the brachial artery is anastomosed to the cephalic vein). We do a primary balloon angioplasty that during the initial fistula creation which has been shown to greatlyy improved the maturation process time. A fistula will take a number of weeks to mature, on average perhaps 4–6 weeks. During treatment, two needles are inserted into the fistula, one to draw blood and one to return it. The advantages of the AV fistula use are lower infection rates, because no foreign material is involved in their formation, higher blood flow rates (which translates to more effective dialysis), and a lower incidence of thrombosis. The complications are few, but if a fistula has a very high blood flow and the vasculature that supplies the rest of the limb is poor, a steal syndrome can occur, where blood entering the limb is drawn into the fistula and returned to the general circulation without entering the limb's capillaries. This results in cold extremities of that limb, cramping pains, and, if severe, tissue damage. One long-term complication of an AV fistula can be the development of an aneurysm, a bulging in the wall of the vein where it is weakened by the repeated insertion of needles over time. To a large extent the risk of developing an aneurysm can be reduced by carefully rotating needle sites over the entire fistula, or using the "buttonhole"(constant site) technique. Aneurysms may necessitate corrective surgery and may shorten the useful life of a fistula. To prevent damage to the fistula and aneurysm or pseudoaneurysm formation, it is recommended that the needle be inserted at different points in a rotating fashion. Another approach is to cannulate the fistula with a blunted needle, in exactly the same place. This is called a 'buttonhole' approach. Often two or three buttonhole places are available on a given fistula. This also can prolong fistula life and help prevent damage to the fistula. Balloon angioplasty maturation is emerging as an important method to increase and improve function of autogenous arteriovenous hemodialysis access (AVF’s). Through the sequential dilation of small veins, large diameter AVF’s can be created with the inherent benefits of easier cannulation, greater overall surface area, improved patency, and fewer complications. A usable AVF can be created in a shorter amount of time, decreasing the need for dialysis catheters. In addition, selective angioplasty of the AVF inflow and outflow can facilitate improved flow rates and increase access longevity. Our approach, including primary balloon angioplasty during AVF creation, sequential balloon angioplasty maturation, and surveillance fistulograms has shown to have the highest success rate. 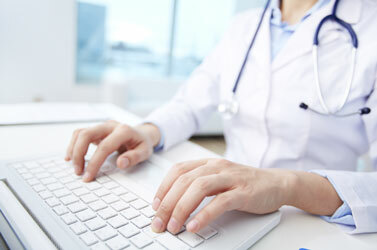 These studies are performed to monitor the function of the fistula or graft. This is a diagnostic procedure done in the operating room by a specially trained, vascular/endovascular surgeon, interventional radiologist or interventional nephrologist. It is an injection of a contrast dye which allows for the doctor to examine the blood flow from the arterial anastomosis to the central circulation system. The purpose is to identify the area in the vascular system that is the cause of a problem associated with the dialysis fistula or graft. Indications for this procedure may include weak thrill or bruit, prolonged bleeding, cannulation difficulties, high venous pressures and/or low flow rates. An angioplasty procedure is performed on the dialysis access site when the physician determines the decreased blood flow is caused by stenosis, or narrowing of the vein. To correct the problem, the physician will place a balloon catheter across the targeted area to dilate and expand the vein and increase the blood flow. The procedure lasts approximately 30 minutes and the hemodialysis access is immediately ready for use at the dialysis center. The main indication for a stent is if the balloon angioplasty fails to achieve a satisfactory treatment of a narrowing or stenosis in the vein or adjacent artery, if the vein is too weak, covered stents can be used to repair areas of injury called extravasation. The stent is a metal tube that is put in the vein or artery to keep it open for optimal blood flow. Stents have withstood the test of time but do require maintenance to optimize patency. The stent is placed in the vein in order to maintain an open and healthy blood flow through the fistula. This is a safe approach designed to optimize results and improve the overall lifestyle of the dialysis patient. The thrombectomy procedure is performed to clear a blood clot that has formed at or near the dialysis access site. To de-clot the access minimally invasive techniques are used. 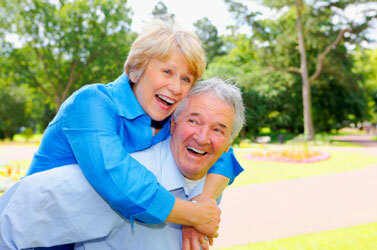 TPA is a medication that is used to dissolve the clot. Combined with balloon embolectomy which is used to break up and pull out the clot thus restoring function of the graft or fistula. A Doppler study may be ordered before a fistula is placed to help the doctor evaluate the flow of blood through your veins and arteries. The test uses ultrasound waves to make a picture of the blood going through your blood vessels. The doctor can then make a “road map” of your veins and arteries. The picture below was drawn by the doctor and is a “road map” of this person’s vessels. During a Doppler test, a handheld instrument (transducer) is passed lightly on the skin above a blood vessel. The transducer sends and receives sound waves. The sound waves bounce off solid objects, including blood cells. The movement of blood cells causes a change in the pitch of the sound waves. If no blood flows through an area, the pitch does not change. The sound waves are sent to a computer, which changes the sound waves into pictures. The specially trained vascular/endovascular surgeon then decides the appropriate placement of an AVF. Complete Catheter Services Central Venous Access placement Due to various medical factors some patients may need a catheter for dialysis during the interval period required to mature a fistula or there are times when your immediate need for dialysis is more important than fixing your fistula or graft. 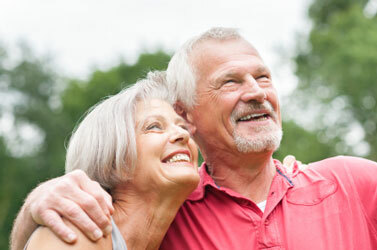 We can place a catheter in your neck or groin using our ultrasound machine. Our Ultrasound machine can show us the best place to put a catheter without having to try several times. We can also treat your catheter if it gets blocked up because of blood or a fibrin deposit on the catheter. We can treat this using medication to dissolve the blood or fibrin, by mechanically removing the clot or by changing the catheter over a wire. Central Venous Access placement Due to various medical factors some patients may need a catheter for dialysis during the interval period required to mature a fistula or there are times when your immediate need for dialysis is more important than fixing your fistula or graft. We can place a catheter in your neck or groin using our ultrasound machine. Our Ultrasound machine can show us the best place to put a catheter without having to try several times.